Peterborough & District, winners of the Peterborough League's Albert Rowlett Cup, pictured with League president Jean Redhead. (Left to right): Barry Oxborough, Brian Bassam, Jeff Clipston, Cliff Watson, Alec Emery, Mick Greaves, Wilf Redhead, Ivor Jackson, Joe Martin. Local bowlers head to Skegness this weekend for the start of the English Bowling Federation national championships, and they will do well to emulate last year’s success. 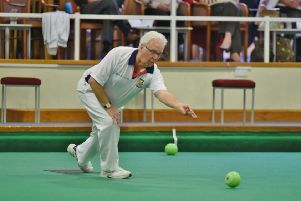 Northants won two men’s individual titles, as well as the Adams Trophy inter-county title for the first time, and had four other finalists 12 months ago. City of Peterborough Belvedere, winners of the Peterborough League's Mick Lewin Trophy, pictured with League president Jean Redhead. (Back row, left to right): Peter Leaton, Malcolm Squires, Roger Martin, Geoff Hedges, Derek Briers, Graham Jackson, Colin Lake. (Front): Linda Darani and Norma Squires. Sarah Newson (Parkway) bids for a hat-trick of national titles, including the pairs with her mother Val where they will be hoping to go one better than last year when they lost in the final. 2b singles: Peter Cox (Langtoft Pearl), Thursday 2.15 v Notts. 4b singles: Neil Wright (Parkway), Tuesday 11.45 v Northumberland. U25 singles: Stephen Harris (Blackstones), Thursday 12.15 v Cleveland. Veterans singles: Mick Duell (West Ward), Thursday, 9.15 v Suffolk/North Essex. Secretaries singles: Malcolm Squires (City of Peterborough), Thursday 12.15 v Lincs. Champion of Champions singles: Howard Shipp (Parkway), Wednesday 4.45 v Derbys. Pairs: Nick Wilkie & Paul Buckley (Blackstones), Tuesday 1.45 v Derbys. Senior pairs: Graham Jackson & Roger Martin (City of Peterborough), Wednesday 10.45 v Norfolk. Mixed pairs: Chris Morton & Simon Law (Parkway), Tuesday 4.45 v North Essex. 2b rinks: Stuart Reynolds, James Harford, Trevor Collins (sub for Mike Robertson), Wednesday 9.15 v Durham/Norfolk. 3b rinks: Neil Wright, Tony Scarr, Simon Law (Parkway), Tuesday 2.15 v Humberside. Mixed rinks: Sarah, Jeff & Val Newson (Parkway/Whittlesey Manor), Tuesday 11.45 v Lincs. 2b singles: Sheila Craig (Conservative), Thursday 1.45 v Cleveland. 4b singles: Sarah Newson (Parkway), Thursday 9.15 v Notts. U25 singles: Louise Harris (Blackstones), Friday 9.15 v Humberside. Senior singles: Norma Squires (City of Peterborough), Tuesday 1.45 v Suffolk. Secretaries singles: Linda Darani (City of Peterborough), Tuesday 10.45 v Northumberland. Champion of Champions singles: Joan Butcher (Whittlesey Town), Tuesday 11.45 v Cleveland. Pairs: Sarah & Val Newson (Parkway), Tuesday 9.15 v North Essex. Senior pairs: Pat Bussey &amp; Sheila Craig (Conservative), Tuesday 9.15 v Northumberland. 2b rinks: Carol Warters, Shirley Suffling, Chris Ford (Ketton), Wednesday 9.15 v Northumberland/North Cambs. 3b rinks: Carol Warters, Shirley Suffling, Chris Ford (Ketton), Tuesday 2.15 v Suffolk. Peterborough & District, beaten by Whittlesey Manor B in last year’s Munday Shield, gained ample revenge by comfortably defeating the defending champions 70-37 in the Peterborough League’s Rowlett Cup at Whittlesey Town, home green of League president Jean Redhead. In the Mick Lewin Trophy final, the Club 60 League’s KO Cup, CoP Belvedere, battling to avoid relegation from the Premier Division, defeated title hopefuls West Ward Tigers 59-54, their rink wins coming from Roger Martin and Malcolm Squires. The third and final League decider takes place at Whittlesey Town tonight with CoP Molins facing Yaxley Kites in the Munday Shield. CoP Belvedere bt West Ward Tigers 59-54 (CoP Belvedere rinks first): Peter Leaton, Colin Lake, Roger Martin 22, Mick Hatch, Jim Bradley, Dave Hilton 19. Derek Briers, Graham Jackson, Geoff Hedges 12, Steve Johnson, Phil Afford, Rod Maplethorpe 21. Linda Darani, Norma Squires, Malcolm Squires 25, Jenny Hilton, Alan Sewell, Mick Duell 14. Peterborough & District bt Whittlesey Manor B 70-37 (Peterborough & District rinks first): Jeff Clipston, Alec Emery, Mick Greaves 20, Alan Croxford, Janet Duffy, Robert Burbridge 14. Barry Oxborough, Cliff Watson, Wilf Redhead 30, Steve Keen, Melvyn Beck, Zack Brown 10. Joe Martin, Ivor Jackson, Brian Bassam 20, Andrew Overton, Colin Truman, Stuart Woodcock 13. Catherine Popple’s Parkway rink of Sarah Newson, Julie Masters and Val Newson reached the quarter-finals of the national fours at Leamington. They defeated Durham 26-16, Oxfordshire 22-8 and Dorset 21-18 before losing 23-26 to the defending champions from Northants. Popple also reached the last 16 of the national singles, the former international defeating Jean Collier (Wilts) 21-10 and current international Sue Davies (Worcs) 21-17 before going down 10-21 to junior international Rachel Tremlett (Herts).